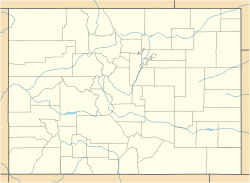 Wolcott is a census-designated place (CDP) and a U.S. Post Office located in Eagle County, Colorado, United States. The population as of the 2010 census was 15. The Wolcott Post Office has the ZIP Code 81655. A post office called Wolcott has been in operation since 1889. The community was named after Edward O. Wolcott, a United States Senator from Colorado. Wolcott is located in central Eagle County at 39°42′10″N 106°40′42″W﻿ / ﻿39.70278°N 106.67833°W﻿ / 39.70278; -106.67833 (39.702696,-106.678448), in the valley of the Eagle River, a west-flowing tributary of the Colorado River. U.S. Route 6 passes through the community, following the river, while Interstate 70 forms the southern edge of the CDP, with access from Exit 157. I-70 and US-6 each lead 7 miles (11 km) east to Edwards and west 10 miles (16 km) to Eagle, the county seat. Colorado State Highway 131 intersects I-70 at Exit 157, passes through the center of Wolcott, and leads north 72 miles (116 km) to Steamboat Springs. ^ Dawson, John Frank. Place names in Colorado: why 700 communities were so named, 150 of Spanish or Indian origin. Denver, CO: The J. Frank Dawson Publishing Co. p. 52. This page was last edited on 24 February 2018, at 01:56 (UTC).